The gun is a powerful instrument: with one pull of the trigger, it can end a life, push one onto the path of revenge, or wreak justice. But in videogames, the gun is inert, flaccid; nothing more than a few pretty pixels painted together to create another object within the environment. For many, this is the purpose of games - to provide a concrete experience grounded in gameplay mechanics, as opposed to an exercise in symbolism and iconography. But in putting this goal before all else, videogames concede their ability to produce images of consequence. In a vain attempt to tack meaning onto an otherwise meaningless image, developers have placed an inordinate emphasis on technical details. What have developers sacrificed in their attempts to create the biggest, deadliest guns? 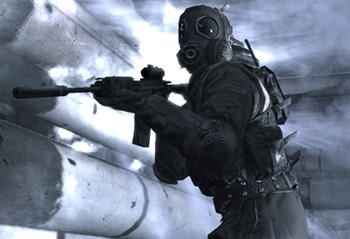 Tom Endo argues in From the Barrel of a Gun that the gun's portrayal in videogames is vastly different than it's portrayal in other media, and asks the question: What do videogames lose when the gun is nothing more than a tool of destruction? Read From the Barrel of a Gun here, and share your own opinions on guns in videogames.